I have had the pleasure, along with my husband, of being able to introduce nearly 100 people to an experience they never expected to get involved in, let alone enjoy. In fact, I would hazard a guess that the vast majority of them were terrified the first time they picked up a handgun. But they faced the scary monster, knowing we've come to a time in our history when it is beneficial for them to be educated in the art of gun-handling. They were now ready to take that first important step: professional instruction in a safe and secure environment. This post is not about the satisfaction I have when a woman, who was scared to death of picking up an unloaded gun at the beginning of the training, leaves the range at the end of the day wanting more. It is not about seeing her sense of accomplishment and a new appreciation for her ability to defend herself. Instead, it is about the selfless commitment and dedication of the instructors, who give up their weekends and time off with their families to offer their skills and knowledge to neophytes who don't know the difference between a clip and a magazine, and don't have the first clue how to even pick up a handgun. Last weekend, we enlisted their help once again, and they answered the call. We only had 7 students this time, hardly worth giving up a beautiful spring Saturday. But they didn't hesitate. They spent as much time, with as much patience, as if we had brought them our normal class of 22 - 25. As they expressed to the group, they love what they do. 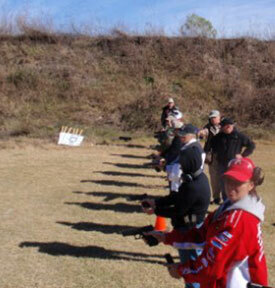 Their enthusiasm for introducing women to tactical gun training is evident in their calm, relaxed manner and their eagerness for each student to become proficient in the basic gun-handling skills. Whether it is a woman handling a gun for the first time, or a seasoned male shooter who thought he knew it all, every person we have introduced to these instructors has thanked us over and over for introducing them to this level of professional gun training. They leave the range a safer gun owner; exhausted, but excited about the skills they've acquired. So I want to personally thank Daryl, Jay, Pat, Lisa and Dr. Tobin, and ALL the professional gun instructors across this great nation who provide a valuable service in maintaining a free citizenry. We appreciate you! You are right....a simple thank you is not enough. How fortunate we are to have access to a wonderful & committed group of instructors!